One of my Mission Possible 2008 goals was to find a purpose for my gorgeous Misti Alpaca yarn and actually put it to that use. …which I like much better! Yarn: Misti International Misti Alpaca Sport [50 g/146 yards] Less than 1 ball each! Mods/Notes: Each hat has it’s own attractive characteristics, though I much prefer the second hat. 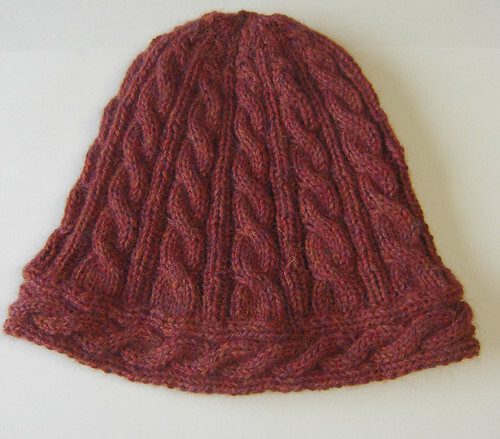 I’ll include instructions to both in the pattern when I finally get around to writing it up. Mom loves her matching set. As she was leaving to go home, I caught her red-handed trying it all on, yet again. She even took the first hat, just in case. So I only have a partial ball left of the Misti Alpaca. I’d say that counts as MISSION ACCOMPLISHED! Oh! And I got the selling feature to work on here, so non-ravelers (are there any left?) can get the pattern. 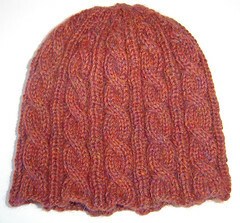 Just go to the Dizzy Blonde Designs pattern page. This looks amazing! 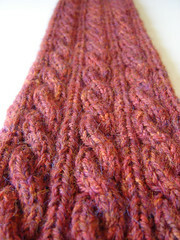 Not patient enough for cable knitting myself these days. Glad to see another addict out here. Wahoo, you’ve been alonged. Excellent! I LOVE the second version of the hat, too. The first one is pretty cute, but you’re right about the waifish look from the edge. The second one is a great match for the IHS. I hope we get Alaskan cruise pictures of the set in the wild. 😀 Nice. You’re moving right on up there. How come when you say you’ve been a-longed, it doesn’t sound so innocent?